If you had to choose just one area of Scotland to visit for walking, then this would have to be it. Perthshire, Angus & Dundee and the Kingdom of Fife offers a perfect microcosm of all that Scotland has to offer the walker. From seaside strolls, to forest walks, and mountain hikes. There is an idyllic walk for everyone here — guaranteed! At close to 4000ft (1220m), Ben Lawers is the highest mountain in the Central Highlands and as a National Nature Reserve, its long southern slopes are renowned for their alpine flora. This walk requires hill walking experience and navigational competence all year round. From the National Trust for Scotland Visitor Centre car park, follow the wooden boardwalk (Nature Trail) for the initial stages. 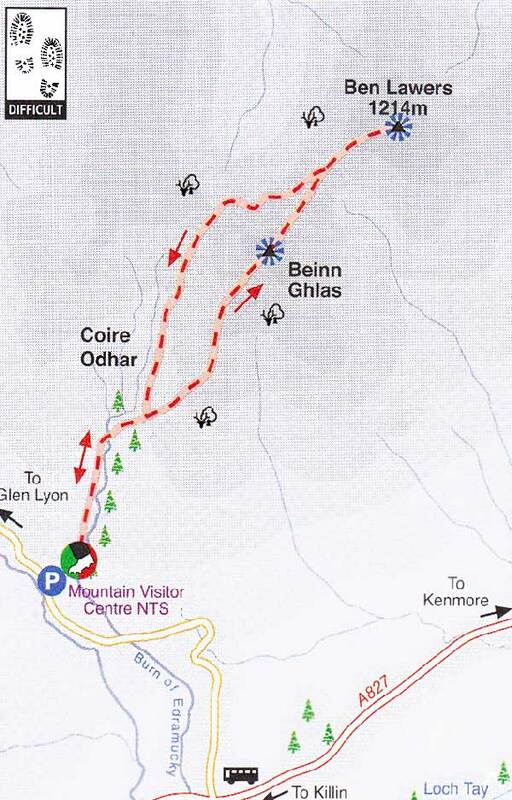 Then follow the well worn main path up or to higher ground, crossing a small burn and on to the steep shoulder of Beinn Ghias 3618ft (1103m). There are precipitous drops north from the summit of this first peak. 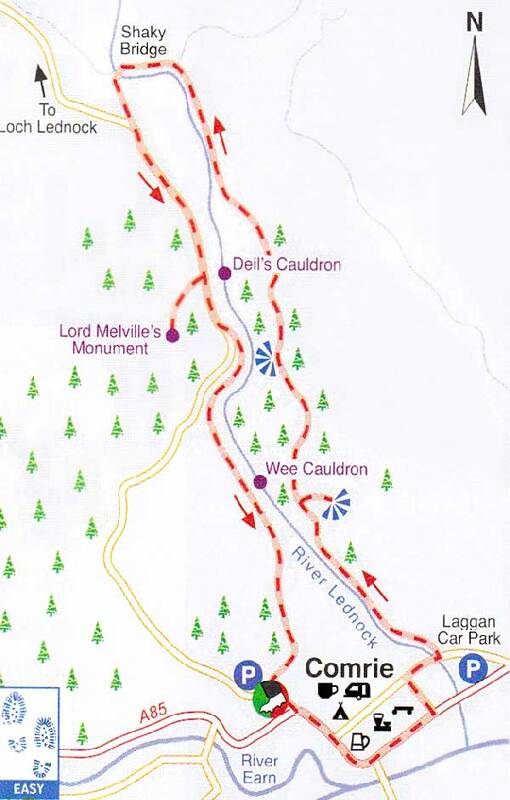 Continue north-east to a bealach (pass) from where an initially rocky ridge leads to the summit of Ber Lawers. Return to the bealach and the outward route, of take the right hand track, which leads back via Coire Odhar. Distance: 10.5 miles. Time: 6/7 hours. Loch Freuchie lies in a sheltered location in Glen Quaich behind the tiny settlement of Amulree. 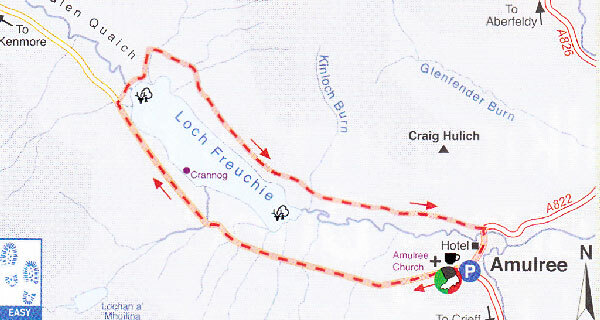 This is an attractive circular walk around the loch on a minor road and good tracks. From the car park follow the single-track road up Glen Quaich. The road bobs and weaves across the bogland to give views of Loch Freuchie. Continue walking high above the loch to reach the northern end where you turn right past the head of the loch. A small shingle beach makes a good half-way resting place. Further on you’ll pass old shielings (houses), which were abandoned in the early 1800’s when some 300 crofters (farmers) emigrated to Canada. Continue on the track, through a wood, back to Amulree where you can learn more about the colourful history of the area in Amulree church. Distance: 8 miles. Time: 3 hours. From the Laggan car park, the walk follows a delightful way-marked circular route through mixed and conifer woods with dramatic waterfalls along the way. The first part of the route climbs steadily by the River Lednock and through ancient woodland before taking you deep into a wooded gorge. The route passes by the Wee Cauldron, which is a taster for the much larger pothole known as the Deil’s Cauldron (Devil’s Kettle), This impressive feature was formed at the end of the last Ice Age and a viewing platform allows one to safely contemplate the forces that created it. Cross the Shaky Bridge for the return where there is an optional steep but worthwhile detour up Dun More to Lord Melville’s Monument. This will add approximately 30 minutes to the walk but rewards with wide ranging views. Distance: 4 miles. Time: 2 hours. This remote walk, in the Cairngorms National Park is ideal for wildlife lovers; the area is well known for its adders and the rare ring ouzel. Walk west from the car park past the historic ruin of Invermark Castle to reach Lochlee Churchyard. The 18th century Scots poet Alexander Ross is buried here. 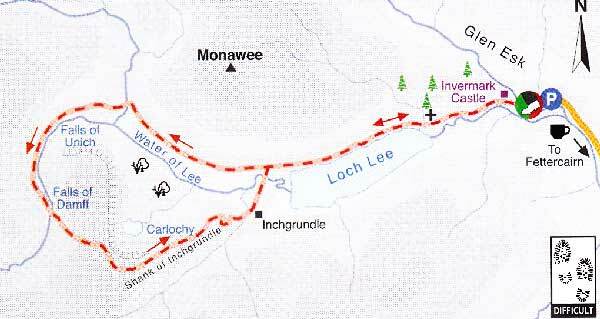 Continue along the north shore of Loch Lee for four kilometres to cross the Water of Lee and head towards the Falls of Unich. There is then a fairly steep climb, past an interesting outcrop of mica schist, to reach the Falls of Damff. Cross the bridge, just after the falls, and head for Cairn Lick where a good Land Rover track is joined. This leads downhill to Inchgrundle where you follow the north shore of Loch Lee for your return. Distance: 5 miles. Time: 2.5 hours. Enjoy tremendous views in all directions on this short walk. Don’t underestimate the terrain though. Temperatures plummet in the Angus Glens – Captain Scott of the Antarctic stayed in this glen for a year, planning and testing equipment before his ill-fated journey to the South Pole. From the car park, follow the track uphill to the Airlie Tower, which was erected in memory of the 9th Earl of Airlie who died in the Boer War. There is also a brazier here in which a fire is lit when a new monarch is crowned. Continue north along the ridge for three kilometres to just beyond The Goal (marked on OS map by the 450m contour line). From the col pick up a track, which leads south through Cotgibbon Plantation. This rejoins the road 2km from the car park. Crombie Country Park has 100 hectares of mixed woodland and a picturesque reservoir. This was constructed in the 1860’s to supply the growing population of Dundee and to power its expanding industries. The park is home to red squirrels. woodpeckers and roe deer as well as grebes and heron. Crombie is also known for its unusual butterflies. The Discovery Trail which is suitable for all abilities, including wheelchairs, is way-marked with a yellow sign. The start of the path can be reached via the Birchwood Trail, which leaves from the car park. There are several interpretation points en-route where you can find out more about the natural and local history of the area. 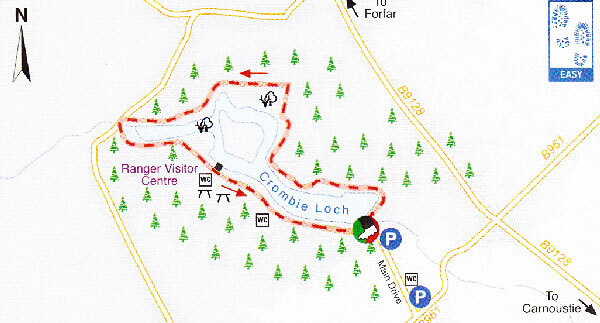 The route finishes at the Ranger Centre. Return to the car park via the main drive. Distance: 7 miles. Time: 4 hours. This very scenic section of the 150km Fife Coastal Pat starts at Ravenscraig Park in Kirkcaldy. Within minutes you’ll have left the hustle and bustle behind. Follow the Fife Coastal Path signs past the cliff-top ruins of Ravenscraig Castle before walking down from the clifft and through a park towards Dysart, where you can vis the Coastal Centre at the harbourmaster’s House. Head through the picturesque fishing village and continue, beside the sea again, past the fringes of Chapel Woods until you reach West Wemyss. 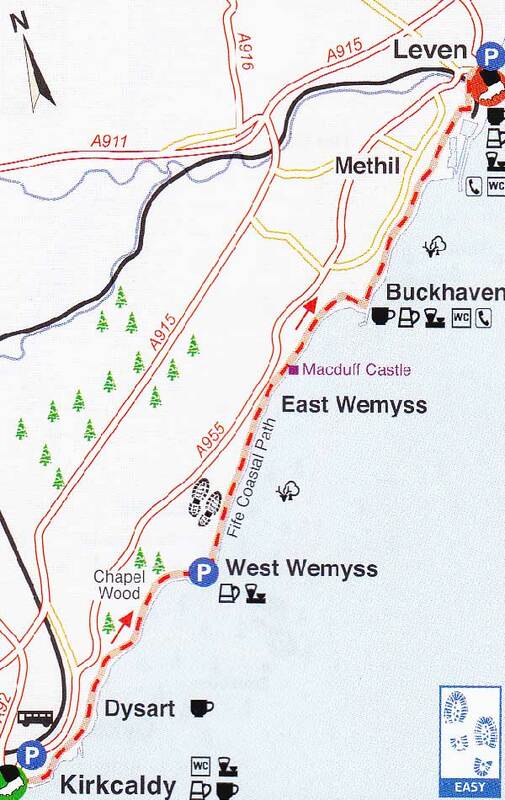 Continue along the seafront out of the village, past an old collier pit, until you reach the next coastal village of East Wemyss. Further on, lie the prehistoric marked Wemy Caves and the ruins of Macduff Castle where there are some excellent views of the coast which make up the end your walk. This is an easy walk along a fine sandy beach backed by dunes and conifer plantations and is ideal for all the family. Tentsmuir Forest is a haven for woodland wildlife while Tentsmuir Point, further round the coast is a National Nature Reserve and is an important area for seabirds, seals, butterflies and many plants. 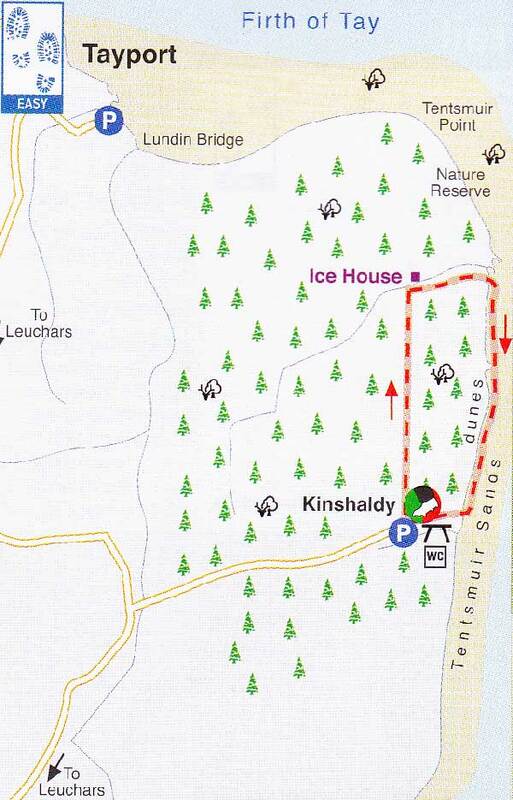 The walk is way-marked from the Kinshaldy/Tentsmuir car park through the pinewoods and leads to a former ice house. This 19th century building was used to keep salmon fresh. From here you have the option to either continue along the way-marked path through the forest or turn right on the path just before the ice house to reach the beach (as mapped) past World War Two fortifications. Turn right to return along the beach and back to the start. 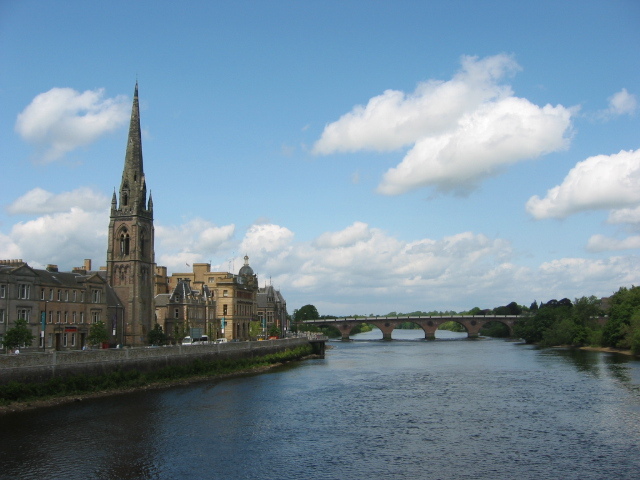 Perthshire, in the very heart of Scotland, has a magnificent and varied landscape of high mountains, tranquil lochs and glens, and clear rushing burns (streams). Woodland lovers will be in their element here too: the area has a long woodland heritage and outstanding individual trees. To the north of Perth, at Meikleour, you can marvel at the world’s tallest hedge — a 30m (100ft) high wall of beech trees, or visit the ancient Fortingall Yew near Loch Tay, which, at between 3000 and 9000 years old, is Europe’s oldest living thing. Like many artists and writers, Shakespeare was drawn to Perthshire’s great woodlands. Birnam Wood, in Highland Perthshire, features in the dramatic closing act of Macbeth. A single gnarly remnant of this wood survives and can be visited as part of an excellent walk. For further information on this, and much more. 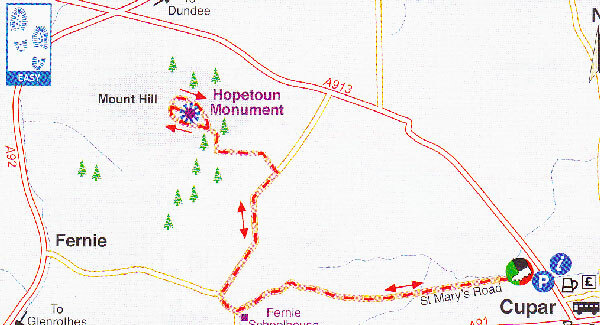 One of the best ways to experience the unspoilt Perthshire countryside is to explore the extensive way-marked path network. There are many miles of easy-to-follow paths, which radiate out from the towns and villages. These pass through local woods, over small hills, and by beautiful riversides. The newest path network is in Blairgowrie, in East Perthshire, where there are five routes across varied terrain and countryside to enjoy, including one through a stunning bluebell wood on the southern outskirts of Blairgowrie. Angus & Dundee also has a huge range of walking opportunities. The area extends from the North Sea, through the rich lowland valleys, or straths, and all the way to the high windswept plateaus at the southern edge of the Cairngorms National Park. Locals have long explored the quiet Angus Glens, which offer a quintessential Highland experience – one that every walker should sample. The Angus Glens Walking Festival offers an ideal introduction to this seductive area to newcomers and old timers alike. The walking festival is based in the market town of Kirriemuir, which was the birthplace of J.M. Barrie — author of the world-famous Peter Pan. Now in its sixth year, the four-day event, which runs from 29 May to 1 June, attracts some 400 walkers. You can be assured of great fun, banter and views along the way. Experienced leaders will guide you through this appealing, yet relatively unknown part of Scotland. In addition to introducing you to the long, finger-like, five Angus glens, the guides will delve into their considerable knowledge of history, wildlife and culture. 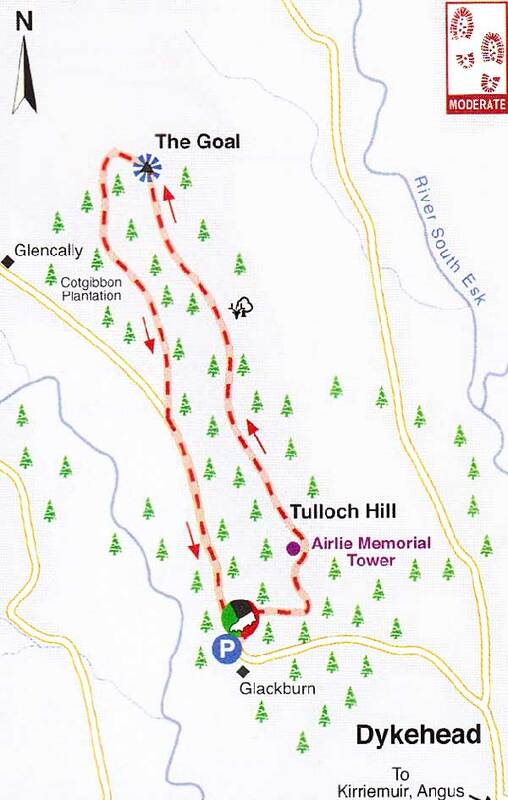 If you’re lucky you may see the golden eagle, that talismanic bird that lives in the high crags by the wild corries. And there’s a good chance you’ll see other upland inhabitants like red grouse, red deer and the bounding mountain hare. Walking magic also abounds, to the south of Dundee, in the Kingdom of Fife. This ancient administrative area, which consists of twenty five Royal Burghs, is compact yet varied. Here you can enjoy many low-level walks and potter around countless charming villages. There are also plenty of opportunities for coastal walking as Fife is bounded by the Firths (estuaries) of the Forth and Tay, to the south and north respectively, and juts east into the North Sea. The wonderful and very popular way-marked Fife Coastal Path passes through some stunning locations and can be enjoyed at any time of the year. It stretches 150kms from North Queensferry (by the iconic Forth Bridge) to the Tay Bridge. Whether you fancy walking the whole length or just day sections you’ll find historic castles, old smuggling caves, quaint fishing villages and fabulous beaches. Inland lie many forest routes. There are several forests, both coniferous and deciduous, dotted around Fife where you can follow way-marked walks, which are perfect for the family and for wildlife watching. Look up to catch a glimpse of the sprite-like red squirrel in pine forests. And at Tentsmuir Forest, by Leuchars you’ll have a good chance of seeing large numbers of seals as well as hearing their eerie calls. Near Kelty, Blairadam Forest, which was previously owned by the 18th century Scottish architect Sir William Adam, is famed for its autumn colours. In west Fife, Devilla Forest, will appeal to those with an interest in archaeology as the forest has a long history of occupation and use. Prehistoric coffins, stone circles and Roman urns have all been found throughout the forest. Pick up a leaflet on Fife’s forest walks from any local Tourist Centre.